At Morton Hall, we cherish clematis as amongst our greatest treasures. From March right through to autumn, they are indispensable. We grow more than 80 varieties, which climb through trees and shrubs, spill over arbours, cling to walls and mingle with our roses. The natural ease with which they wind through the borders belies many hours of painstaking pruning and training. Spring- and early summer-flowering varieties (pruning groups I and II) only require tying in. Meanwhile, later-flowering types such as viticella and orientalis (pruning group III) are pruned and trained now, in February, to achieve the desired effect. In the Kitchen Garden, wrought iron arbours are clad in the myriad blooms and seed heads of striking orientalis-type varieties from mid-summer to late autumn. Clematis tangutica ‘Lambton Park’ and ‘Golden Tiara’. To protect from winter winds and prevent excessive seeding, these rampant plants are pruned to a ‘winter length’ of about 6 feet in November, and then again to 5 feet this month. This means that most of the new growth will be above 5 feet, restricting the amount of tying-in later required to tame them. February pruning and tying-in of orientalis-type clematis. Particularly vigorous viticellas like ‘Emilia Plater’ demand strict management when grown in a mixed border to prevent them from smothering their neighbours. Clematis viticella ‘Emilia Plater’ growing through Rosa ‘Falstaff’ and Lilium speciosum ‘Black Beauty’ in August. Clematis viticella ‘Emilia Plater’ growing through Rosa ‘Falstaff’ and Lilium speciosum ‘Black Beauty’ in August. 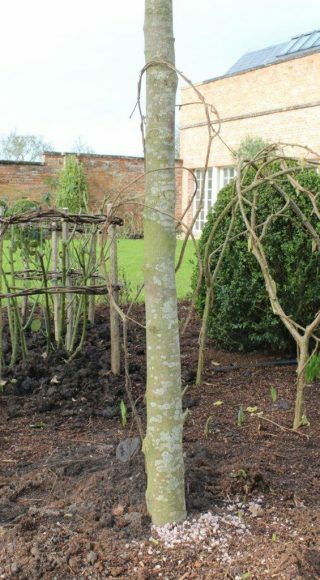 To achieve this playful harmony, a plant support woven from hazel is placed between and around the roses after they have been pruned. The Clematis is then pruned to about 2 feet and tied into the hazel structure. Hazel support for Clematis ‘Emilia Plater’. 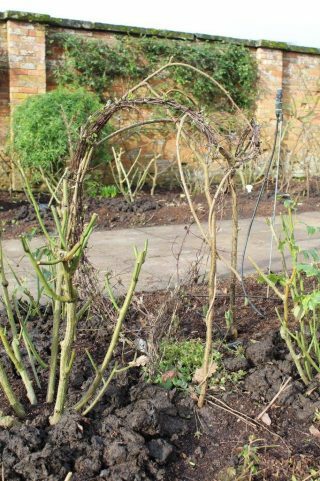 From now until late May, all new clematis shoots will be tied to these supports, keeping the weight off the roses while they are growing and getting ready to flower. 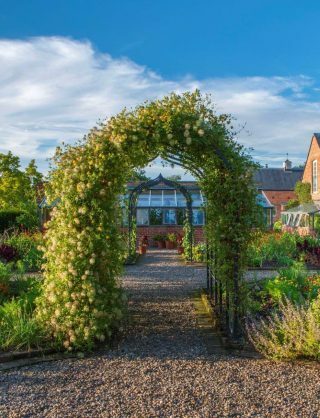 Once the roses reach full height, we stop tying in the clematis, thereby allowing them to scramble through neighbouring plants, while their main weight rests on the supports. Less vigorous early summer-flowering varieties are the opposite: they need assistance to reach the light before their partnering roses outcompete them. If not, clematis blooms would be sparse and remain hidden inside the rose. 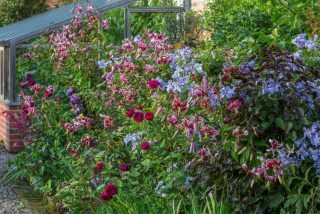 Clematis ‘Royalty’ and Rosa ‘The Shepherdess’ in June. 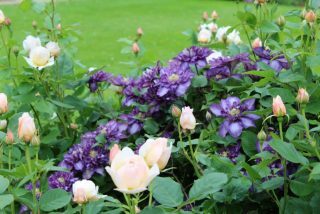 To give the clematis a ‘head start’, the rose is pruned relatively hard and the unpruned clematis then tied to a slightly taller hazel support. 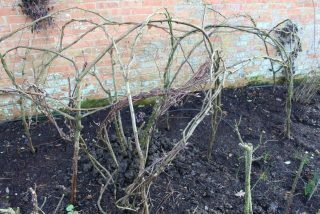 Hazel support for Clematis ‘Royalty’ inside three plants of Rosa ‘The Shepherdess’. 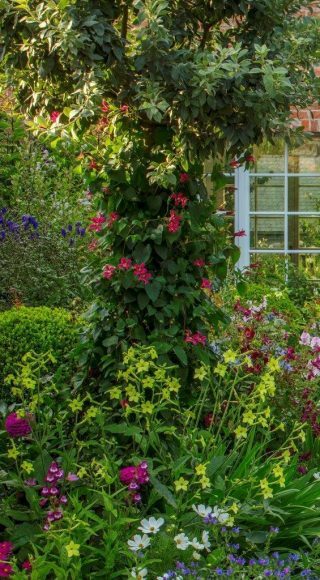 Intertwined hazel branches are also useful in helping clematis climb trees. 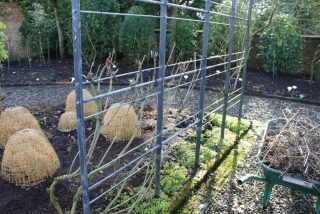 Here, thin hazel branches are woven together to form a ‘cage’ around the tree to which the clematis is then tied. Clematis texensis ‘Princess Diana’ climbing up the stem of an ornamental silver pear. We spend more time managing clematis than almost any other garden plant. Building endless supports in the bleak winter may be arduous, but there is ample reward in the summer when duets of roses and clematis perform in perfect harmony.